Starting his first official day of high-level meetings as part of the week-long United Nations General Assembly meeting in New York on Monday, President Trump is holding a series of bilateral meetings with leaders from South Korea to France where he is expected to discuss the U.S. role in the world. 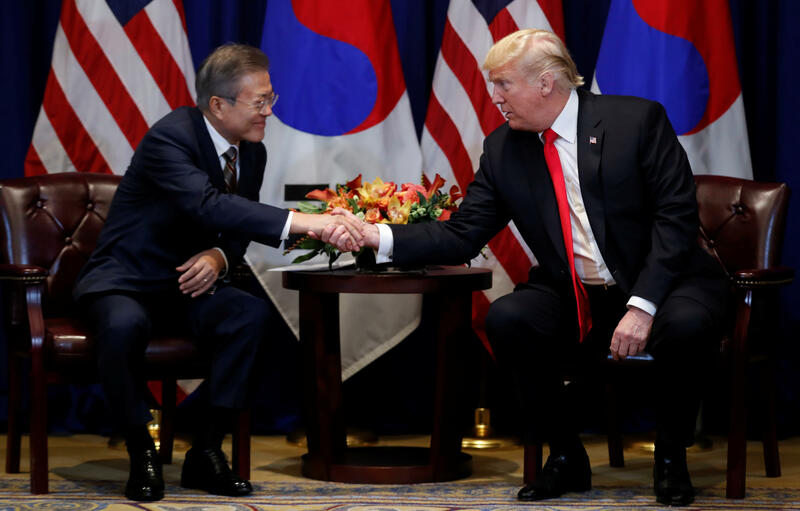 Mr. Trump, in his meeting with South Korean President Moon Jae-In Monday afternoon, said the two nations had done "very well" with respect to North Korea, and would be discussing that progress in the next couple days. Moon, through a translator, said there is progress on denuclearization with North Korea. Moon also said North Korean leader Kim Jong Un has a message for Mr. Trump, that he is committed to denuclearization. Kim expressed his unwavering trust in Mr. Trump, Moon said in passing along the North Korean leader's message. Mr. Trump said his administration would be announcing a second summit with Kim in the "not too distant" future, adding that the location is "to be determined" and they're not in a rush. Mr. Trump said it would likely not be in the same place as the Singapore summit. Trump: 2nd Kim summit to take place in "not-too-distant future"
"We will be having a second summit in the not-too-distant future," Mr. Trump said. The president also signed a new United States-Korea Free Trade Agreement in a signing ceremony with Moon. Mr. Trump said that, from "day one" he promised the American people he would make good trade deals, saying he's making good on that promise. "It's a very big deal," Mr. Trump said. "It's a great day for the United States and it's a great day for South Korea." The president said he thinks American farmers "are going to be extremely happy," and be sending a lot more farm products to South Korea. Mr. Trump, in his meeting with French President Emmanuel Macron, said the two have had great experiences, "on occasion not so good but 99 percent very good." Earlier Monday, the president delivered a brief address at a meeting on the "Global Call to Action on the World Drug Problem," where he said that the U.S. is committed to "fighting the drug epidemic together" as the "scourge" of drug addiction continues to grip much of the U.S. and its closest allies around the world.